^ Dean Livelybrooks, Physics of Sound and Music, Course PHYS 152, Lecture 16, University of Oregon, Fall 2007. Ortiz-Berenguer, Luis I., F. Javier Casajús-Quirós, Marisol Torres-Guijarro, J.A. Beracoechea. 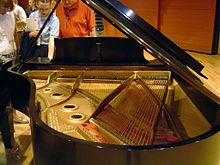 Piano Transcription Using Pattern Recognition: Aspects On Parameter Extraction: Proceeds of The International Conference on Digital Audio Effects, Naples, October 2004. Railsback, O. L. (1938). “Scale Temperament as Applied to Piano Tuning”. The Journal of the Acoustical Society of America 9 (3): 274. Bibcode: 1938ASAJ....9..274R. doi:10.1121/1.1902056. Sundberg, Johan (1991). The Science of Musical Sounds. San Diego: Academic Press. ISBN 0-12-676948-6. Weinreich, G. (1977). “Coupled piano strings”. The Journal of the Acoustical Society of America 62. doi:10.1121/1.381677. Giordano, Nicholas J., Sr (2010). Physics of the Piano. Oxford: Oxford University Press. ISBN 978-0-19-878914-7. D. Clausen, B. Hughes and W. Stuart "A design analysis of a Stuart and Sons grand piano frame"